Subject:Resources for Uemura Shoen paintings? 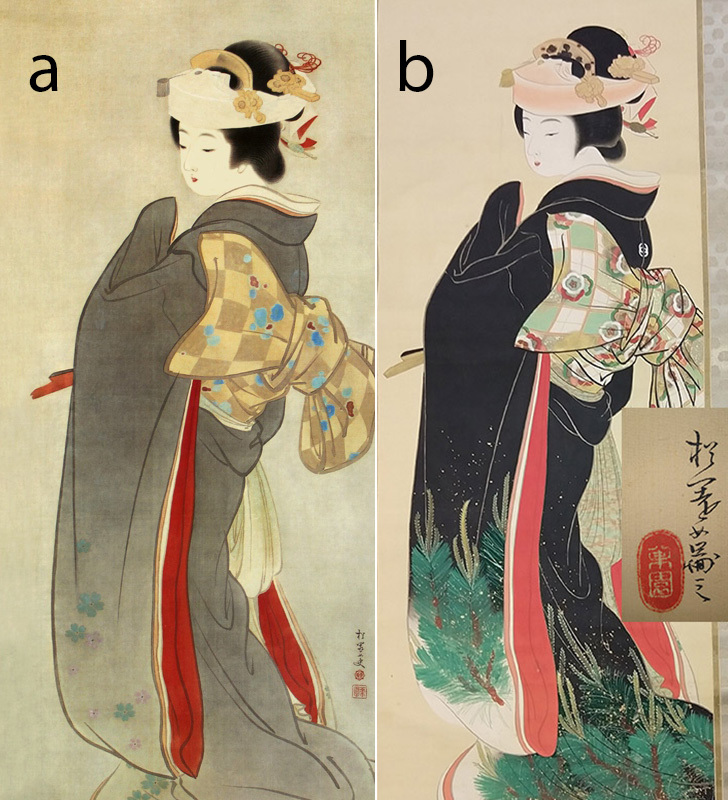 A fairly broad question: can anyone provide information, or even where to look, for the Uemura Shoen scroll pictured here on the left in picture (a)? This is a low resolution image from a printing company that will put the picture on a cloth for you (see the link), but there is no real information on the actual scroll. Shoen appears to have made two different versions of this (b) from the same preparatory drawing, or perhaps one is not genuine. The one I am looking for information about is on the left (a). The one on the right (b) was purchased in Japan by an American working there, probably in the late 1960s. My print resources do not include either of these paintings, and (a) is the only online image I can find. The printing company lists the title as "人生の花" (springtime of life), which is actually the title of a different Shoen painting of a bride and her mother, so I don't trust their title. Any assistance would be greatly appreciated.